Andrew was born in Guisborough, North Yorkshire in 1961. After leaving school, he completed an apprenticeship in joinery, and later completed a Diploma course in graphics and illustration. It was during a spell working as an archaeological illustrator that he met his wife and in 1991 they headed for the Highlands of Scotland where he had always found inspiration in the dramatic and unspoilt beauty of the Cairngorms. A decade later, however, they and their daughter returned home to his beloved Yorkshire. 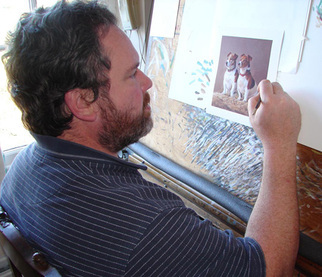 Andrew has exhibited his work among many of the world's top wildlife artists and each autumn stages a one-man show in his home town of Guisborough. He is a member of the prestigious Royal Society of Miniature Artists, Sculptors and Gravers, receiving awards over several years at their exhibitions at the Mall Galleries, London. In 2017 he was commissioned by the Jersey Post to produce a range of stamps to celebrate the 150th anniversary of the J.S.P.C.A. and, over the years, has been commissioned by many top companies including Bacardi, Penguin Books, HarperCollins, Land Rover, Barclays Bank, Marks and Spencer and the New York Botanical Gardens. He was especially proud, as a Yorkshireman, to be asked to work with Taylor's of Harrogate, in producing a range of paintings for their "Yorkshire Tea" brand packaging.